Home > Fire Safety & EMS > Fire Safety Evacuation Supplies & Tools > Fire Extinguisher Arrow Signs > 3D Angle Rigid Plastic Fire Extinguisher Arrow Sign - 4" x 12"
Home > Fire Safety & EMS > Fire Extinguisher Arrow Signs > 3D Angle Rigid Plastic Fire Extinguisher Arrow Sign - 4" x 12"
Home > Fire Extinguisher Arrow Signs > 3D Angle Rigid Plastic Fire Extinguisher Arrow Sign - 4" x 12"
Our 3-D rigid plastic Fire Extinguisher Arrow Signs are silk screen printed with UV ink making them durable and fade resistant. These two-panel plastic signs feature pre-drilled mounting holes for easy mounting on any wall. 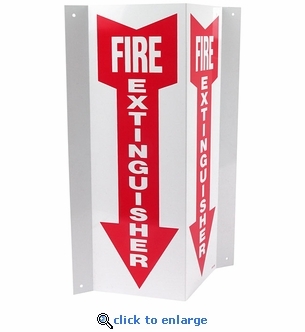 Ensure your fire extinguishers are visible from a distance at any angle when quick action is needed in an emergency. Rigid Plastic 3-D Fire Extinguisher Arrow Sign - 4" x 18"
Panoramic 3-D Mounted Glow in the Dark Arrow Sign - 4" x 12"
9 or more qualify for Free Shipping. Orders 25 or more will ship UPS Ground.